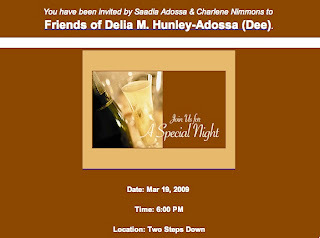 In her challenge to Council Member Letitia James in the 35th District race, Delia Hunley-Adossa relies significantly on her campaign treasurer, Charlene Nimmons, who also heads a questionable fledgling nonprofit organization that signed the Atlantic Yards Community Benefits Agreement (CBA). As with Hunley-Adossa’s Brooklyn Endeavor Experience (BEE), Nimmons’s Public Housing Communities (PHC) likely relies on the largess of developer Forest City Ratner. If so, given the light workload of both nonprofits, the salaries Nimmons and Hunley-Adossa both draw from their nonprofits give them leave to work on the campaign--which suggests that the developer is supporting the challenge to James even without direct contributions. 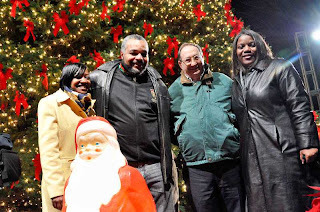 Nimmons was on the dais last December at the MetroTech tree lighting ceremony, and later posed (at right) for pictures with Bruce Ratner, developer of both MetroTech and Atlantic Yards. 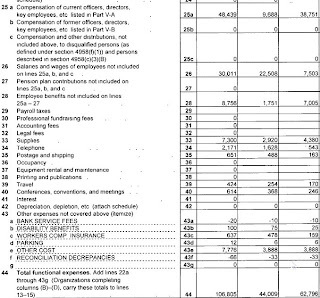 In fact, as described below, the Internal Revenue Service Form 990 (PDF) required of nonprofit organizations suggests that Nimmons’s PHC makes Hunley-Adossa’s BEE look like Common Cause. According to its 2007 Form 990, PHC has one board member, apparently Nimmons. It has no fundraising expenses. It has no program expenses. It spends a large majority of its money on salaries. It has no stated functions. Its one officer is described as “Soul Watcher,” which is either Nimmons's nickname or an alias. It even fails to report, as the graphic indicates, where the organization's books are kept. Nimmons is both executive director of PHC, one of eight CBA signatories, and also the treasurer of the CBA Executive Committee, a group Hunley-Adossa heads. 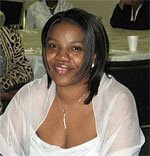 Charlene Nimmons is the Executive Director of Public Housing Communities Inc. She has lived in the community over 18 years and served in many capacties. Beginning with the New York City Board of Education parent teacher association, where she volunteered as a parent Advisory member. She was elected president and then second vice president on the district level. She also worked for five years for the same system as a child and teacher associate. In transition she began volunteering as the resident association president for Wyckoff Gardens Association. Recognizing the need to be pro-active and being a help to her neighbors.This encouraged her to branch out in the field of job development in the local area she reached out to other community leaders and developers to seek opportunities for the population that she is committed to serve. Ms. Nimmons was determined to address their concern. She contacted local developers and some additional community leaders in an effort to create more job opportunities. 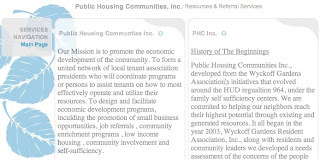 Ultimately, her efforts resulted in the formation of Public Housing Communities, Inc. (“PHC”), a consortium comprised of the presidents of various residents associations and others, all of whom are committed to establishing and promoting programs that promise to enhance small business development, job creation and referrals, community enrichment, community involvement and self-sufficiency in Brooklyn’s public housing communities. I'm here in support of Atlantic Yards for several reasons. I'm here today advocating for the jobs that are planned for minorities and women. I'm here to advocate for the environmental protections in place in the project under the environmental assurances section of the CBA. And I'm here because public housing residents, those most often invisible, forgotten and neglected, receive priority in the various aspects of the CBA. As part of the CBA, resources will be directed to help the area public housing communities. This push began for us at a Council of Tenant Association Presidents meeting in 2003 when a New York City Housing Authority (NYCHA) official briefed us on budget cuts and insisted that we seek out funds to close the gaps that we would be facing. Programs and resources were going to be eliminated and we were counseled that we had to solicit public and private dollars. The cuts hit us hard and we began to look at developments happening in the city and other companies. ...Because of the Community Benefits Agreement we will also be working with FCRC to sponsor annual job fairs serving the public housing complexes. There are job training resources in our community, there are jobs in the community and there are people needing employment. We plan to connect them. Our Mission is to promote the economic development of the community. To form a united network of local tenant association presidents who will coordinate programs or persons to assist tenants on how to most effectively operate and utilize their resources. But the 2007 Form 1040 does not list any “Program Service Accomplishments,” a required section, nor describe its “primary exempt purpose.” So it's not clear if any such network of tenant association presidents has been formed. In 2007, the organization raised $172,900, and spent $62,796 on management and general expenses, plus $44,009 on program services, leaving $66,095 in the bank. However, a closer look shows that nearly all of the $106,805 spent went to compensation, including $48,439 to officers (“Soul Watcher”), $30,011 to other employees, and $8756 in employee benefits. Other large chunks of the budget went to supplies ($7300) unspecified “other cost” ($7776). Where does the money come from? Nimmons wouldn’t answer my query, but, given that there were no fundraising expenses nor--to my knowledge--fundraising events or campaigns, it’s a good bet that the funding came from Forest City Ratner. As noted below, a December 2007 article in the Courier-Life chain quoted Nimmons as crediting FCR for supporting an economic resource fair. Nimmons has also given good quote, no matter how nonsensical, to Stephen Witt, the Courier-Life reporter notorious for unskeptical reporting about the Atlantic Yards CBA. It shouldn't be big news that the head of a Ratner-supported group would be supporting Ratner, but the Courier-Life has treated it as such. Local supporters of the Atlantic Yards project charged last week that the community is being choked out of any positive coverage occurring between developer Forest City Ratner Companies (FCRC) and the local community. “It’s just a focus around the negative qualities of the Atlantic Yards project,” said Charlene Nimmons, who signed the CBA on behalf of the New York City Housing Authority Tenants Association. “We hear more about the opposition, but we don’t hear anything about the groups that are working to bring forth positive action in the community,” she added. Nimmons said a case in point is the FCRC-sponsored Economic Resource Fair that her organization hosted last week at the Atlantic Terminal Community Center, 501 Carlton Avenue. The event, which got 40 people registered for services, involved Long Island College Hospital, the New York City Housing Authority Resident Employment Services, Opportunities for a Better Tomorrow, Health First and the Municipal Credit Union Program. Those organizations overlap significantly with the list of partners on the PHC web site. "They are the real land grabbers, because they took the property first and turned back what was jobs into condos," chimed in Charlene Nimmons, sitting nearby and a signatory to the Atlantic Yards community benefits agreement (CBA) with developer Forest City Ratner Companies (FCRC). Well, as I pointed out, the industrial buildings had closed, with no activity until housing developers came along. Nimmons is not only Resident Association president of Wyckoff Gardens, she also serves as Vice-Chair of the Executive Board of the Brooklyn West District of the NYCHA Citywide Council of Presidents. "We've had this seat for many years and nothing's been done with it," said Charlene Nimmons, who is with the Wyckoff Gardens Tenant Association. Referring to Mr. Yassky, Ms. Nimmons, who is black, said, "I know what he's done, and I can see him continuing that." In an 8/5/06 article, the Times described how Yassky had run into trouble in his efforts to court black voters, given that Thelma Davis, the mother of the late Council Member James E. Davis, and her son Geoffrey Davis had rescinded their endorsement. Over the last three years, Ms. Nimmons said, Mr. Yassky has assisted the association in getting $150,000 from the city to refurbish its community room and $7,500 for its offices. She added that Mr. Yassky had helped put into place financing for $300,000 in new security cameras for the Wyckoff Gardens complex. The event at Wyckoff Gardens aimed “to publicize $600,000 Yassky had earmarked for long-sought security cameras there and in the neighboring Gowanus Houses. Nimmons was among those at the press conference. Nimmons clearly has a track record beyond Atlantic Yards. But she should be answering some obvious questions about her role as head of PHC. Was the Izod Center 61% full last night? Was the Izod Center 90.7% full Friday night? WSJ on AY: "A Hole Grows in Brooklyn"